Image courtesy: Spinsheet, credit Dan Phelps. It was two in the morning, blowing at least twenty-five knots, when a huge breaking wave hit us on our starboard stern and threw the boat sideways. The boom buried and we were knocked flat in a full broach. Tim was seated aft on the port side and slid underneath the lifelines feet first. He was shoulder deep in the water hanging on to a winch with one arm. Someone blew the guy and the kite ran free. As it collapsed, the boat recovered and in a flash, Tim used the upward momentum to one-arm his way back on deck. A few minutes later we had the kite wrestled aboard, and we went with a smaller headsail. Earlier that day, a modest broad reach had gradually built to a playful 10-knot surf, and then, at about midnight, a full blown, nuking, bare-knuckle run made more tempestuous by an 9-foot following sea. Syrena’s bow would nudge down and briefly hesitate as her stern lifted on the leading edge of a breaker, and she’d launch and careen down the face of the wave sending spray to the height of the first spreaders on both sides, sometimes for many minutes. Each surf broke another speed record. We consistently saw mid-teens, and we peaked near 20-knots on one wet slalom. This was what our B-32, a little ULDB (Ultra Light Displacement Boat), was designed to do. We were racing hard, but we had both eyes on safety. As the wind piped up, we made certain that every person was wearing full weather gear, a PFD, a light and whistle, a harness, and we were all tethered to jack-lines. We were de-powered, running with our chicken-chute strapped down, and the boat loved it, like an unleashed puppy, until the roque wave took us down. Tim was a bit shell-shocked, but he was with us. My wife slid in close and asked how old Tim was. She whispered something like “Holy Cow,” but with more colorful vocabulary. 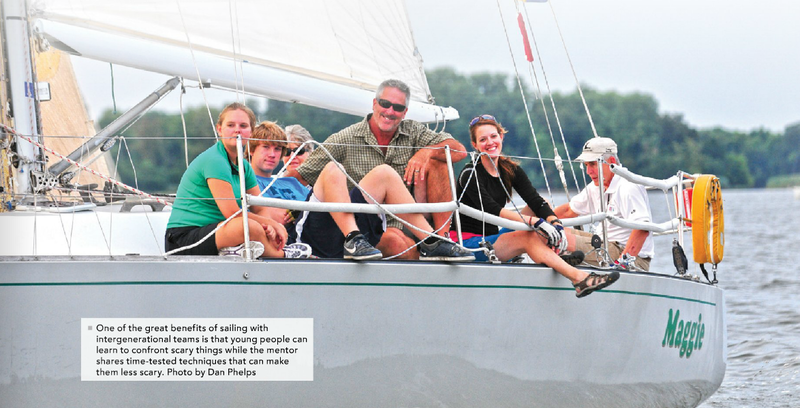 One of the most difficult sailing challenges you may face will be taking other people’s kids. You are sure to run into situations that seem daunting and extreme and that make you second guess the idea. Fearing such a thing, many people just won’t do it. While I understand the feeling, I think it’s a mistake to give in to it. Granted, I’ll never forget looking at Tim in the water, seeing the reflective tape on his PFD glowing in the light from the instruments, and for a few seconds, not being able to reach out and grab him with the boat pinned on its side. I also can be confident that had Tim lost his grip, he still would have been safe. He was securely tied to the boat with his harness and tether. The crew would have responded with a quick stop and pulled him back aboard. It would have been wet, chaotic and scary but we would’ve done it. We had rehearsed and knew the drill. We will all face scary things throughout our lives. One of the great benefits of sailing with intergenerational teams is that young people can learn to confront scary things while the mentor shares time-tested techniques that can make them less scary, or at least more manageable. The mentors are rewarded too, as the level of sailing and fun grows with each experience. We also let them know that if they break any of the initial rules, we’ll still come back and get them, but we’ll be steamed, because it will be slow. Then we wink and explain the rest of our rules. 2.) Mix experience and proven process with youth. Take kids and other eager newcomers, but make certain to also include folks who know what to do in an emergency on your crew. Talk with the vets about their role in teaching and sharing safe practices. If you don’t have the experience, then find someone else who does. 3.) Be honest with the parents. Invite them to listen to your safety talks before you go racing. Explain the risks and how you intend to manage them in clear and direct language. Make certain that they know that you are serious about safety and fun and that you have confidence in their kids to be and do the same. If you have room, invite the parents too. At the same time, remember that skill levels always grow if a team stays together for a time. So in short order, the fun, teamwork, and performance levels will go way up and the safety will remain. Recently, a sailing mom told me that when someone on her crew called for a code zero during a night race, someone else added, “Put Willem in a harness first, ‘cause it’s gonna be squirrelly.” Willem was a young rookie and partial to nodding off to sleep on the rail. She smartly vetoed the bigger kite this time. In a year or two, Willem is going to be the one asking for the bigger kite. Mom will be ready when he does. You might be thinking that we were pushing it a bit too hard the night that Tim got wet. We could have reduced sail more than we did when the wind rose over 20 knots. But the experienced ones were doing what they knew, keeping an eye on the loads and motion, insisting on the right safety gear and discussing emergency procedures. Tim, even at sixteen, was up to the challenge. He jumped right back in to the race, taking turns at the helm, at sail trim, and helping us to our first ever podium finish in an offshore race with the boat. Today, ten years later, Tim is a civil engineer living and working in Hawaii, where he sails almost every day. His younger brother has replaced him as an active member of our crew. Sometimes Tim comes home for visits, and he’s usually game to join us for a sail. When he does, we always recount the infamous wipeout. Somewhere along the way, I may have mentioned it to his mom. If not, it’s out for certain now. I really like your information. thanks so much for sharing it. You are currently reading Sailing with other people’s kids at Saving Sailing.